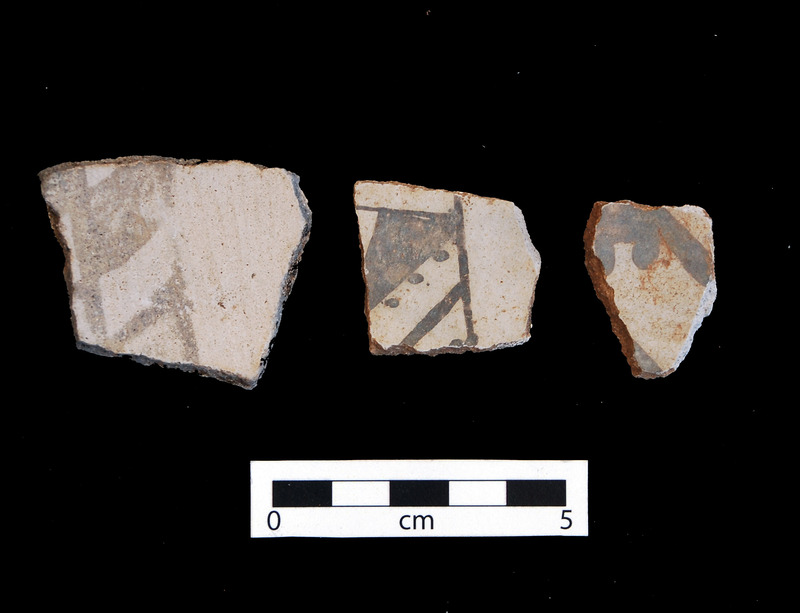 Deadmans Black-on-gray sherds. Click the image to open the Deadmans Black-on-gray gallery. Deadmans Black-on-gray is a type of San Francisco Mountain Gray Ware found around the headwaters of the Verde River, including Chino Valley, Cataract Creek, and the Cedar, Deadmans, Kana’a, and Walnut drainages, Arizona. Date Range: A.D. 1025-1140 (per Christian Downum, Northern Arizona University). Temper: Abundant fine quartz sand; occasional grain dark angular fragment; abundant fine mica-like particles. Surface Finish: Exterior jar surfaces and interior bowl surfaces are fairly well smoothed; not polished; anvil marks definite but not conspicuous on interior jar surfaces; mica-like particles glitter on surfaces. Surface Color: Light bluish gray. Paint: Black, dull, usually thin. Design: Confined to bowl interiors and jar exteriors; fine and narrow lines; often in series with interspaces about 4 times as wide as wide lines; small solid triangles, often with pendant dots or short fringe-like lines. Comparisons: Deadmans Black-on-gray has Black Mesa style designs, while Floyd Black-on-gray has Kana’a style designs.